Statue of James Wilson, the nineteenth century Economist who was born in Hawick. The fate of Hawick’s James Wilson statue could soon be decided as council officers say they have identified a suitable location. A marble tribute to Wilson, who founded the Economist magazine, was created by Edinburgh sculptor John Steell in 1865 and until last year stood in the Economist’s old head office in London. 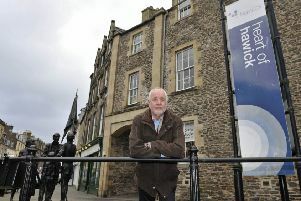 The 12ft-high sculpture was gifted to Hawick after the magazine moved office, and it arrived in town amid much fanfare in August last year, taking up a place of honour outside Tower Knowe. In December the statue was damaged, with two fingertips from its right hand found to be missing. Police were called in, but it was never established whether the damage was accidental or down to vandalism. 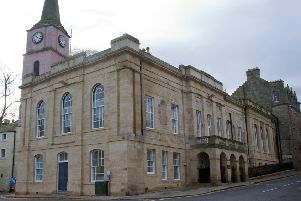 Hawick’s common good fund sub-committee have been looking at potential sites for the statue, with the Heritage Hub emerging as the frontrunner. However, council officers have now ruled out the Heritage Hub, after a structural engineer unearthed problems with the load bearing capabilities of the floors due to the building’s under floor heating system. Now, councillors sitting on the common good fund sub-committee have agreed to move the statue to just outside of the building, and under the external canopy that sits to the right of the entrance. Presenting an update to councillors, Frank Scott, Scottish Borders Council’s maintenance officer, said: “As you know we had a structural engineer come out and check the Heritage Hub, and he has confirmed our suspicions that the floor is not strong enough to take the weight of Mr Wilson. “He did suggest an alternative location hen he was there, which is outside of the of the building, but he would be under the canopy, although not completely. Councillors voted unanimously to agree to relocate the statue, and also instructed officers to look into the cost of constructing a glass box to shield the statue from harm.